Don't overlook your closets! Homeowners share their favorite DIY closet tips to help you turn a closet into a home office, kitchen pantry, laundry, or craft space. See how to install closet organizers, design your own walk-in closets, and turn unused space into hidden storage -- like under the stairs. When selling your home, a remodeled closet (or custom closet) increases the resale value of your home while providing additional space! 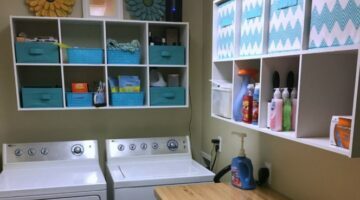 One of our first to-do projects in our new house was to create a happy laundry room. Yes, a laundry room which inspires one to want to “happily” do laundry. My new laundry room is 5×9.5 feet, has a great washer/dryer configuration, lots of storage for household cleaning items, a place to hang freshly laundered clothes, a big table area to fold clothes, and some music! See before & after photos + the details of how we tackled this DIY laundry room makeover. Before installing a pocket door, read these helpful tips. Pocket doors are great, but they have their limitations too. We’re putting some in our home, but we were unable to use a pocket door in the bathroom like we wanted to. Do this and don’t do that! Before you start any home remodeling project, be sure to consider what adds value and what doesn’t if you plan to sell your home. Dreaming of decor like you’d find inside celebrity homes? 5 savvy decorating tips to spruce up your home like a celebrity… minus the expense. 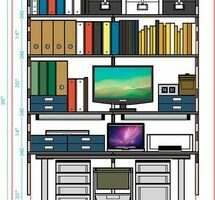 DIY Closet Office Tips: Get Organized With A Closet Office Conversion! Are you in need of a dedicated home office space but don’t have the room for it? If you have a medium-sized closet, you can complete a closet office conversion to gain a neatly organized space. Do you need more storage space in your home? 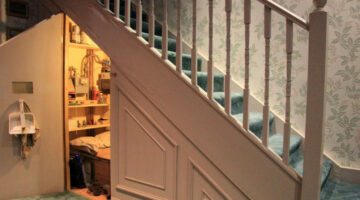 How about taking advantage of a slightly unusual location to create storage under stairs. 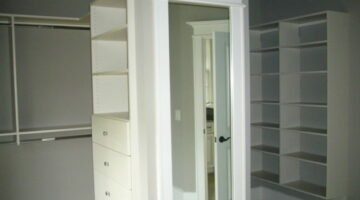 Custom closets are one of the smartest improvements a homeowner can do for themselves and their home. 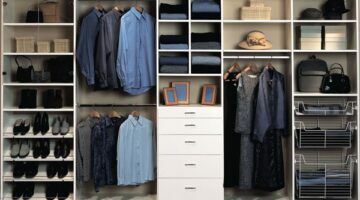 There are many questions that you need to think about before you go through with installing custom closets in your home and I’ve got some answers for you. 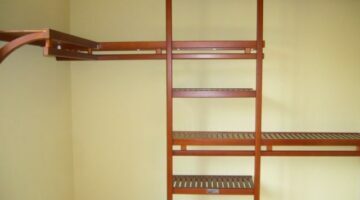 Closet organizing systems constructed of wood are a positive option to wire shelving. No…I do not like wire shelving. Yes…I’m a fan of closet organizers made of wood. Buy it or build it. Either way I’ve got it covered. Having a laundry chute in your home will save you a lot of steps. Here’s a quick photo shoot of a new one from a kids’ perspective. A Bright Idea For The Kitchen Pantry Or A Closet: An Automatic Door Light Switch! This handy little automatic door switch lighting feature in a kitchen pantry is a welcome idea that has been a long time coming. The simplest ideas are sometimes the best. Walk-in hidden kitchen pantries are a nice feature to incorporate into a kitchen design. Here are a few photos to give you some ideas. A new home with a custom his and her walk-in closet with dressing area in The Park at Anderson Farm in Marietta, Georgia by Donny Brook Homes sets the standard by what all homes in this price range should be installing. A brief look at a walk-in closet within a walk-in closet of a master suite in a home in the Blackberry Run section of a gigantic Cousins Properties subdivision being built in northeastern Paulding County known as Seven Hills.